Occasionally in the field of rehabilitation, there is the need to create, source, or fit for splints or other assistive devices. Simple splints can be created using thermoplastics and other splinting materials for such things as ‘wrist or ankle’ joint stability problems. 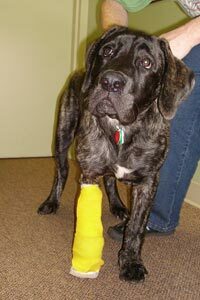 Other times, there is a need for more advanced splinting, slings or even wheelchairs to assist dogs in their recovery or long-term functioning.